Shooter Unable to Fire at Mall Shoppers, Claims "Gun Worked Fine Yesterday"
The American Academy of Pediatrics estimates that firearms are one of the top three causes of death among children, killing twice as many kids as cancer does. Gun deaths exceed motor-vehicle deaths in 14 states. A.) Severely restrict civilian gun ownership. Like these developed countries do. B.) Pray to God. Ask that He alone determine when bullets are fired on a case-by-case basis. It's a tough choice. Americans love their guns as much as terrorists love their guns. Not that Americans are terrorists! Of course not. But we are deeply, passionately, ideologically attached to our guns. Can you imagine Al Qaeda giving up their guns because thousands of their beloved brothers, sisters and little children were dying? LOL. LOL. LOL. Many of you will cringe at the idea of comparing your gun with a terrorist's gun. Your gun is pure, as pure as apple pie. You proudly keep it in your home (locked up, of course!) and your children know where it is but they could never find the key. When you read depressing headlines about kindergartners shooting themselves in the face, you feel sad but you would never, ever consider not having guns. Asking an American to give up their gun is like asking the sun to move over a bit so the glare won't hit your TV screen. Evidently there is absolutely nothing Americans can do. Only God can help. The Chief of Police of Ocala, Florida must have been thinking this very thing. Last week he sent an urgent memo inviting his community to a prayer vigil. The memo says: "We are facing a crisis in the city of Ocala and Marion County that requires fervent prayer." The Chief of Police's answer to stray bullets? Prayer. In the last 30 days stray bullets have struck two children and an infant in Ocala. There were other deaths and injuries from bullets but the Chief obviously feels powerless against the particular variety of bullets known as strays. It's one thing to get shot by a well-intended bullet, but getting shot by a stray bullet doesn't seem fair. Maybe He will redirect all the stray bullets into near-by trees. Maybe He'll send a good-guy-with-a-gun to kill a bad-guy-with-a-gun, making sure the good guy doesn't get shot in the process. Maybe He will send a sobering ray of light to blind a drunk husband causing him to misfire and subsequently reconsider how much he loves his wife. That sounds good. And totally doable. But what about all the other gun deaths? How will God prevent those? The answer seems clear: Guns will only kill when God intends them to kill. Depressed teen with family gun? No. Toddler playing with gun? No. 12-year-old showing off Dad's gun to his friends? No. Drunk Uncle with gun? No. Sober Uncle at shooting range? Yes! Mentally ill grandfather with gun? No. The list goes on. 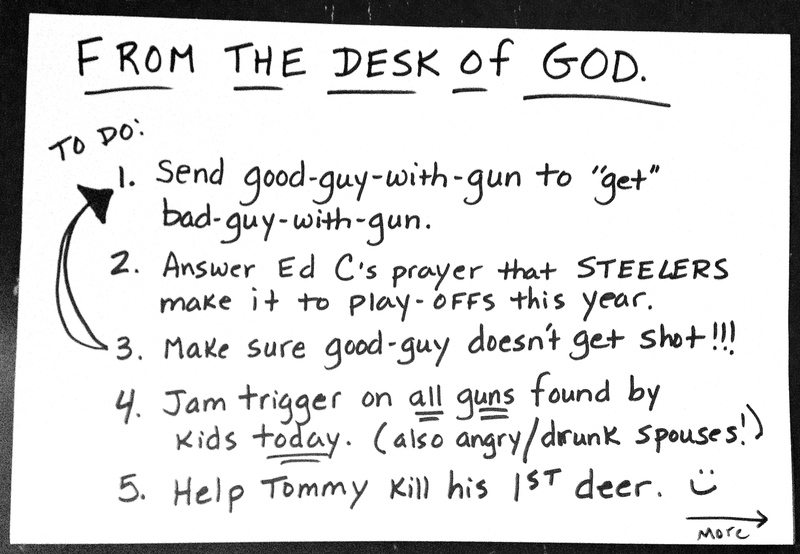 There's no end to the ways God -- and only God -- can spare us from this national crisis of bad shootings. It's exciting to think about the change that lies ahead!